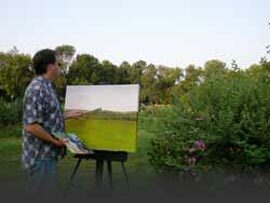 Rick Hasney, contemporary impressionist-style Bucks County artist, who paints oil on canvas landscapes of the local area. Although, oil painting is my main focus, I also do acrylic, pastel, drawing, airbrush, sculpture, pottery, and photography. Studied fine and commercial at duCret School of Art. Areas of focus included but not limited to, anatomy, techniques and media, design origin, perspective, calligraphy, color and design, painting, 3D design, rendering, photography, print making, drawing and composition, advanced painting, airbrush, animation, life drawing, advertising design, pictorial illustration, fashion illustration, silkscreen, portraiture, production methods, technical illustration, ceramics, figure drawing, and pastels. Instructors included: Finck, Bresky, Caras, Fallatico, Rossi, Nelson, Schroll, Banyas, Parsons, Senior and Yanow. Active and former member of various artist groups: Artists of Bristol on the Delaware, Artists of Yardley, Langhorne Artists at the Farm, Langhorne Borough Arts Council, Ocean County Artist Guild, and Broward County Artist Guild. Over 30 years experience as a commercial artist. Jobs ranging from Designer, Technical Illustrator, Web Designer and Programmer, Layout person, Interactive Prototype Designer, User Interface Designer, Typesetter, Plate maker, Camera Operator, Press Operator, Silk screener, and Airbrush artist. Skills range from old-fashioned hand work to high tech state-of-art computer skills. Computer skills include being proficient in all major graphic software. Spanning career, artwork represented in private collections, juried art exhibits, and galleries. Some of which include the 17th Annual Monmouth Arts Council Juried Show (1996), Barnegat Bay Art Show (1997), duCret School of Arts Annual Art Exhibits (1980-1983), ETS Annual Juried Art Exhibit (2002, 2003, 2004, 2005), D & R Greenway Juried Art Exhibit/Gala (2005), Delaware River Gallery, and Riverbank Gallery and Art-o-mat, the art vending company.